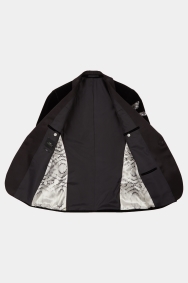 A jacket that’s pretty fly. 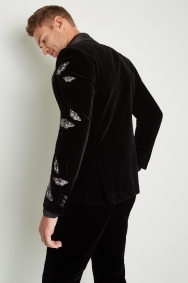 Like moths to a flame, you’ll have all eyes on you in this unique Moss London black velvet jacket. 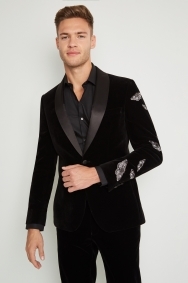 Featuring embroidered moths on the sleeve, contrast lining and satin lapels, you’ll stand out at any formal occasion. Its skinny fit is cut for the closest fit through the chest, shoulders and waist to define and enhance your frame. Pair with a black open-necked shirt and black loafers to impress when the sun goes down. Amazing quality! Looks just like the picture online! Didn’t have my size in stock but thought I would try a smaller size but didn’t fit. Never mind.